A humble knock-on - everybody knows what it is - or do they? And offside - everybody knows what it is and yet still gets hot under the collar about it. They should be understood as they both concern ancient laws. Knock-on dates back to 1866 and offside even earlier - 1846. A player being off his side is to consider himself out of the game, and is not to touch the ball or in any way to intercept the play. It's still, 172 years later, in its essence the same. Now we are trying to sort out something concerning offside from a knock-on. It is not as simple as it may seem - being in front of a player of your team who last played the ball, who knocked on the ball in our cases. The two clips below suggest that the law may require a bit of analysis. The referee awards a scrum to France, where New Zealand seemed to expect a penalty and commentator says, with an air of infallibility: "It should have been a penalty, not a scrum." In the second minute of the match between Australia and Ireland, Kurtley Beale of Australia kicks high. Israel Folau of Australia and Rob Kearney of Ireland's jump for the ball, both outstanding at this sort of skill, but neither catches and the ball falls to ground. Kearney pouts out a right hand towards the ball and plays it. Bundee Aki, in front of Kearney, i.e. nearer the Australian goal-line than his own, grabs the ball and is immediately grabbed by Australian players. The referee penalises Aki, and Bernard Foley, Australia's flyhalf, goals to open the score. Scrum in 1, penalty in 2. Was the referee wrong in 1? in 2? The business of playing the ball in front of a team-mate who had knocked on, was first addressed in 1948, and there it was decided that there should be "scrummage for the first offence - a knock-on". in 1956, that this was indeed a penalty for offside. In 1957, England proposed that there be a penalty only if the offside player prevented advantage. England's idea was not then accepted, but soon the law changed to read: When a player knocks on and an offside player of the same team next plays the ball, a penalty for offside should not be awarded unless the offside deprives the non-offending team of an advantage. 1. The ball is knocked on - forward from hands. 2. A team-mate in front of the player who knocked on played the ball. 3. The nearest opponents are about 12 metres from where the knock-on occurred. Médard could himself have gathered the ball that he had knocked on. Other French players could have got to the ball before the New Zealanders. It is a long stretch of the imagination to suggest that Gros prevented the New Zealanders from gaining advantage. When the ball came into Grosso's possession, Médard was already in front of Grosso. Grosso could then have been considered put onside. The second incident is different. When Aki picks up the ball, a good half a dozen Australian players are right there to play it, to take advantage from, Kearney's slight knock-on. In grabbing the ball Aki prevents them from seizing an opportunity for advantage, a really good opportunity for them to go rumbling forward with the ball. 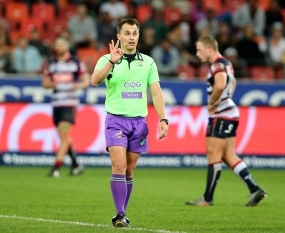 It seems that the referees were right on both occasions – and that the commentator, expressing only a part of the truth, was wrong in the French incident.